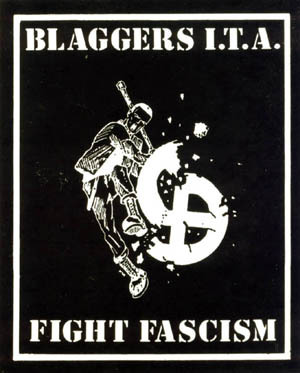 This post contains information and material relating to Blaggers ITA (In The Area) an Anti-Fascist Action supporting band. Matty Blag writes Who are the blaggers were. Below: Matty Blag’s BBC Radio One interview with Mark Goodier from 1993 which coincided with the release of Stresss – the first release for EMI. Life in prison, becoming an anti-fascist, ram-raiding and signing to EMI – what a life! Second is a track recorded live at the Anti-Fascist Action’s ‘Unity Carnival’ on Hackney Downs, London, 6 September 1992. 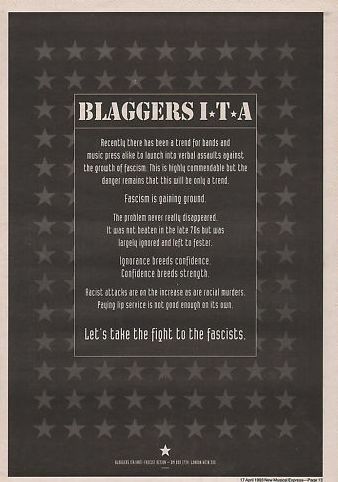 This entry was posted in Anti-Fascist and tagged Anti-Fascist Action, Blaggers ITA, music. Bookmark the permalink.